There's no question about it: some people live and love to workout, others live to do, well, anything else. But in order to live a long and healthy life, all signs point toward physical fitness being a big part of the puzzle. The key is to make fitness work for you. This could mean watching Netflix while you run or walk on the treadmill at the gym, working out in nightclub-like environments such as Solidcore or Flywheel, or even dropping into high-energy full-body workouts like Barre3. Or, it means finding ways to work out at home during your regularly scheduled evening Netflix binges. While this would be much easier if you had a Kardashian-akin at-home gym, stocked with everything you would find in a normal gym (TVs included), that's not reasonable for most folks. Resistance bands, however, are an effective (and cheap!) tool for at-home workouts that can be used in a myriad of ways while distracting your mind with a show or movie. 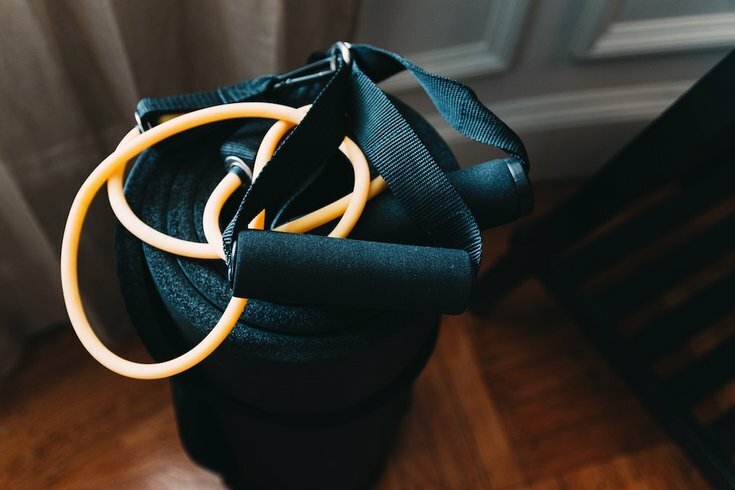 One move that serves as a twofer is punching with resistance bands — which is arguably a three-fer because it works your arms, abs AND serves as an outlet for any built-up stress you may have. “I have my clients grab the bands and walk out in their boxer stance until they feel the ‘pull-back,'” he says. “From here, we shadow box our jabs and crosses at different levels and intensities for one minute at a time for three rounds. “The primary target areas when boxing with resistance bands are your shoulders, biceps, triceps, and core,” says Ferraro. “The arms and shoulders are under constant pressure from recoil of the band. Your core is consistently engaged by the twisting motion when throwing the punches. So resistance training is great for toning and helping to create lean muscle mass in these areas. A set of resistance bands with handles and five varying resistance options is available on Amazon for $20 here (which, by the way, is about the same price as ONE boutique group fitness class).